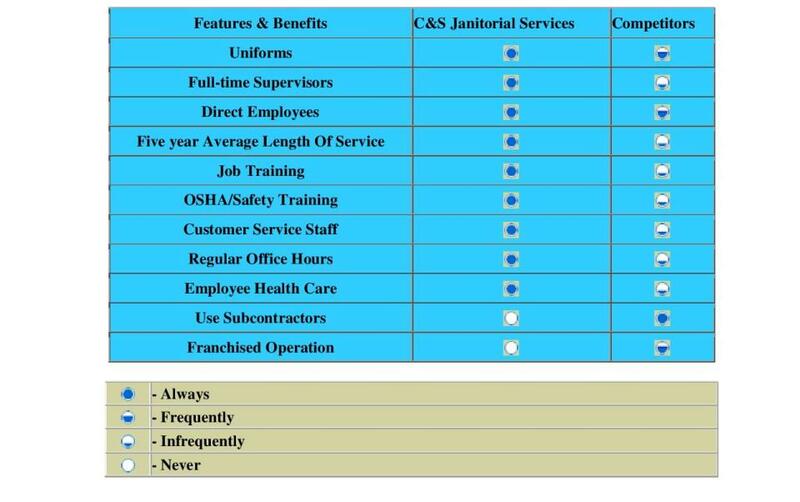 C&S Janitorial Services is certified and compliant as a Texas Historically Underutilized Business (HUB). Our custodians undergo three extensive phases of training to ensure optimum on-the-job performance and accordance with proper standards and procedures. Clients rest assured knowing our janitors are accurate, detailed and highly qualified. Job training goes hand-in-hand with safety training in order to provide clients and employees with the safest possible working environment. During the initial job-training phase, team members undergo an eight-hour training session in the C & S Janitorial Services training room, which provides visual and audio equipment. They receive initial hands-on training and are informed of OSHA chemical and safety procedures. In the second round of education, students advance to a client facility where they work one-on-one with experienced C & S Janitorial staff members and alternates. They are educated in specific building needs, as well as the specific requirements within their assigned cleaning zone. The final phase of C & S training is an ongoing effort to keep employees abreast of the latest advances in janitorial procedures and technologies. C&S Janitorial Services fosters a work environment that encourages teammates to develop the highest quality of life possible. We offer employee bonuses (including cash awards, certificates of excellence, and acknowledgement in the company newsletter) to keep C & S Janitorial Services employees motivated. Monthly and annual employee/team recognition awards are offered. C&S Janitorial Services provides the most productive, cost-effective inspections possible. In fact, we invite our clients to accompany us on our inspection tour. The Quality Field Inspection Program is a series of “preventative” inspections that cover every cleaning zone within a facility. The objective is to actively identify maintenance activities and prevent the buildup of dirt and dust. In addition, monthly evaluations ensure client satisfaction and solicit feedback from occupants, increase janitor participation, and promote management of information. The data gathered assists us in setting future goals for improvement.